While Jefferson Airplane is best know for the vocal and extracurricular exploits of Grace Slick, the singer who took the band to psychedelic heights in the late-'60s, Slick was not the Airplane's first singer. Signe Anderson helped the band ignite its career, singing on its first album, 1966's Jefferson Airplane Takes Off, before leaving the band for family life shortly after that album's release. 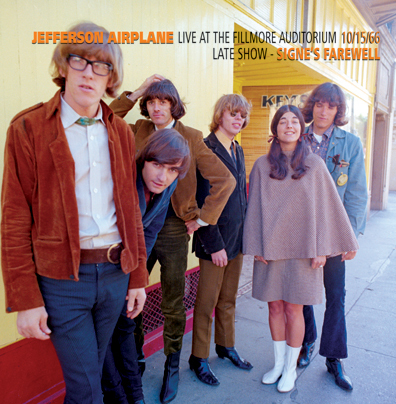 Live at the Fillmore Auditorium 10/15/66 represents the first CD live recording of the Airplane with Anderson. The rest of the group's signatures are already intact—Marty Balin's blues-inflected wail, Jorma Kaukonen's winding guitar, Jack Cassidy's anchoring bass, and Spencer Dryden's solidifying drums—but Anderson's contribution is not to be underestimated.